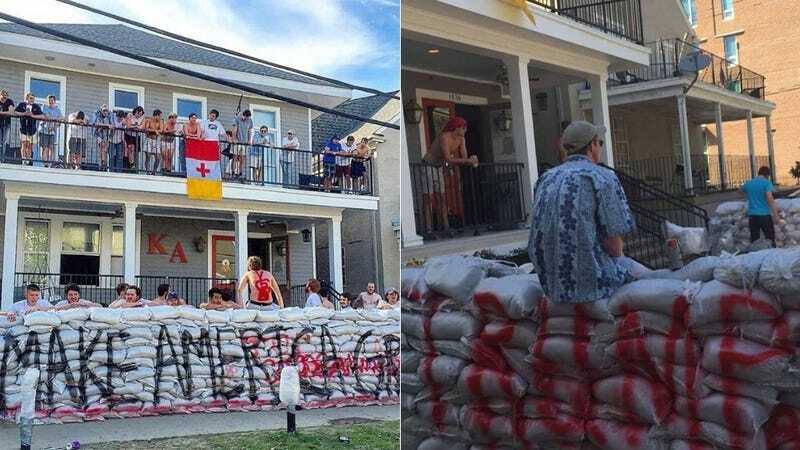 As a part of an annual tradition, Tulane University’s Kappa Alpha fraternity have pledges build a wall around their fraternity house. This year, they added some fun words that made it appear as though they were celebrating presidential candidate and noted racist Donald Trump. According to The Tab, members of the Tulane football team were seen taking down the sandbags on Tuesday afternoon as “Kappa Alpha members yelled at them”; a former student sent Jezebel a link to a YouTube video of the wall being torn down, but the video had been removed. This would not be the first time the Kappa Alpha fraternity has publicly embraced symbols of xenophobia and racism. “Every black person on campus (and those who were attuned to racial insensitivity) knew to stay away from the KA’s,” Tracy Clayton wrote for BuzzFeed in 2015, of her time at Lexington, Kentucky’s Transylvania University in the early aughts, adding that members of the frat had Confederate flags in their windows. As my colleague Kate Dries reported last year, Confederate general Robert E. Lee is still considered the frat’s “spiritual founder” on its website, which proudly features his “definition of a gentleman”; until very recently, the fraternity held an annual formal called “Old South” in which students dressed up in Antebellum costumes and likely longed for the good old days when everybody knew their place (in 2010, the fraternity banned fraternity members from wearing actual Confederate uniforms, along with other “trappings and symbols” that “might be misinterpreted”). Every spring the Kappa Alpha (KA) fraternity erects a wall around its chapter house, which is on private property. The leadership of KA’s local chapter says that adding Donald Trump’s name and slogan to this year’s wall was done in order to satirize the candidate’s campaign promise, not to show support for him. The wall has since been dismantled.